Perhaps you’ve experienced a frozen pipe situation in the past or have heard horror stories about burst pipes flooding the home. Regardless, you’ve come to the right place if you want to protect your pipes for winter. In colder climates, pipes are often installed in places where they can be heated, but many homes in the South have pipes installed outside the home. Since the weather often isn’t cold enough to freeze and burst pipes, homeowners in Birmingham and the rest of the South are neglecting to prepare their pipes for winter. Here is a short list of things you can do right now to make sure your pipes don’t get damaged or burst this winter. Pipes that are located in your attic, basement, garage, and other unheated areas of the home should be insulated with preformed insulation sleeves that you can purchase at your local home improvement store. If you have any questions about the correct insulation and size for your pipe, ask the professional plumbers at OnTime Service. You can either have a professional install pipe insulation for all your exposed pipes or you can attempt it on your own. If you add pipe insulation yourself, make sure there are no gaps between the insulation sections. 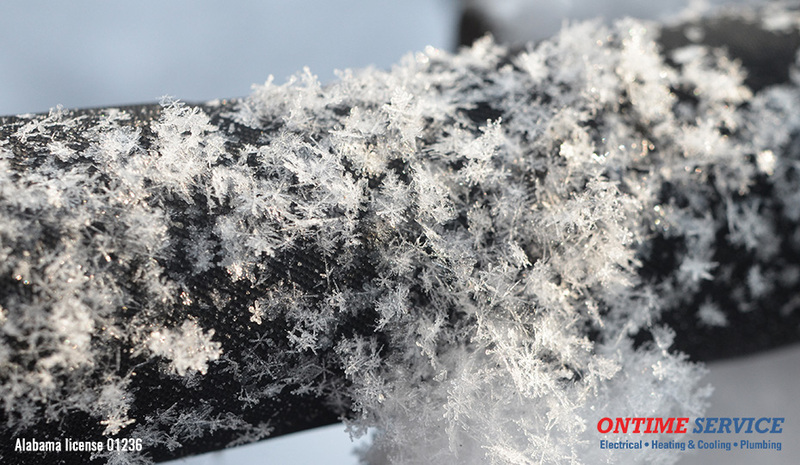 Insulating your cold water pipes will help prevent frozen pipes while also keeping condensation from forming on pipes in high-humidity conditions. It’s also a good idea to insulate hot water pipes to prevent standby heat loss and save a little money. Quality insulation also conserves water since you won’t have to wait as long for water to reach the desired temperature. Additionally, make sure that any pipes near openings in outside walls have proper sealing around the pipe and building material. Insulating pipes is a great first step for getting your pipes ready for winter, but sometimes it’s not enough to prevent frozen pipes. When you have multiple freezing cold days in a row, you might want some heat tape. While there are several different kinds of electric heat tape on the market, it’s important to do you research and know what options are available before making a decision. And always read the manufacturer’s instructions fully for proper operation and safety information. Some heat tape kits are only appropriate for certain materials, such as plastic or metal. Make sure the heat tape has the features you need and don’t forget to measure the length of the pipe you need. Heat tape kits are more advanced than ever before. You can purchase a unit with a built-in thermostat that turns the heat tape on if the temperature is cold enough. These are safer than heat tape kits that need to be plugged in every time they’re needed. Usually, heat tape gets installed on the pipe first and then insulation can be used to cover it. Remember, heat tape can cause a fire hazard if left on for too long. Again, read the manufacturer instructions for proper application. Outdoor faucets are prone to damage from the pressures of expanding ice. Before the first freeze of the season, take the time to winterize your outdoor faucets. Find all outdoor faucets and remove any hoses, splitters, or connections. Drain them of water and store them inside for winter. Find the individual water shut-off valve for each outdoor faucet. The faucet’s shut-off should be located near the faucet on a wall inside your home, often in the basement. Shut off the water supply by turning the valve clockwise. Go back outside and turn on all of your outdoor faucets to drain the rest of the water. If water continues to flow, check the inside water shut-off valve to make sure it is all the way off. Leave the faucets in the on position through the winter. For added protection, you can add an insulated faucet cover. You can find them at the same store that sells pipe insulation sleeves. Freeze or frost-proof faucets are the best way to prevent your outdoor faucet from freezing. If you want to be able to use your outdoor faucets when the temperatures drop, ask your plumber about freeze-proof faucets. For protection against other common winter hazards, go over this winter exterior home maintenance checklist.